If you come here regularly you may have noticed that my blogging has been sporadic, at best, lately. In part, this blog post is to explain that absence, that lack of consistency. However the other large part of why I wrote this post is to give all you other mothers out there a warning — if you are feeling tired, if you are feeling completely run down, please don’t just dismiss it as a normal part of motherhood. Being utterly exhausted is not simply an unavoidable side effect of growing older, or of spending your days chasing after kids, it’s a warning sign that something is off. 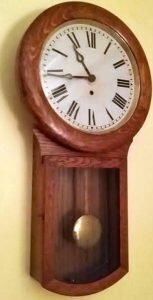 When I was a child we had this big antique pendulum clock hanging on the wall in our dining room. The pendulum would swing back and forth and the clock would make a deep tick tock noise, a sound I always found to be somehow comforting. I loved laying in bed at night and hearing that tick, tock, tick, tock, from down the hall. That clock needed to be wound up once a week. If my mom forgot to wind it the clock didn’t immediately stop on that seventh day. Instead, it slowed down, running bit by bit further behind the electric clock on our kitchen wall. It ticked and tocked slower and slower as it ran down. An imperceptible change, small increments, slower and slower, further and further out of sync, until eventually the clock just fell silent. That was me these past few months. 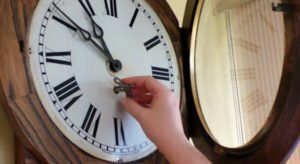 I forgot to wind my clock, but I still kept moving, kept getting through the day to day, just slower and slower, and more full of errors, each day imperceptibly worse than the last, and the changes were so slow, so gradual, that at first I didn’t notice, and once I did notice I discredited it. Is this just what getting older feels like? I would tell myself that I needed to go to bed earlier. I would tell myself that I needed to be more physically active. “Move it or lose it”, as my mom would say. I pushed myself. I told myself that I simply had to DO more, but doing more didn’t make me feel more in shape, more capable or alert. I just felt exhausted. There were days when all I wanted was sleep. Days when I simply could not keep my eyes open. A million dollars, a dream vacation, or sleep? I’ll take the sleep, please. I was tired. I had trouble staying awake. I would doze off at the computer while trying to work in the afternoons. I would fall asleep sitting in a chair in the front room while watching my girls play. There were days during the summer vacation where I simply could not keep my eyes open, and I would hand the iPad to the girls, letting them watch My Little Pony on Netflix while I dozed off, all three of us in a big snuggly heap on my bed. I felt like I was losing my mind. I mean quite literally losing my ability to think sharply, to remember things, to compose words. I wandered through my days in a fog. I dismissed how forgetful I was, making jokes about mommy brain. I thought quietly to myself that I must be getting stupider as I got older. That being in my forties now my brain was starting to rot away. Writing coherent posts grew increasingly hard. I would read back things I had written and find that they were full of spelling and grammar mistakes (ok, I’ve always been guilty of this to some extent, but this was more than usual). Sometimes what I wrote just wouldn’t flow. Rereading it I knew it didn’t quite make sense but I couldn’t find the words. “Writing is suddenly hard. It’s like pulling teeth.” I admitted to friends online. Was this writer’s block, I wondered? I wondered if I was depressed. I didn’t feel depressed. I didn’t feel particularly stressed out, outside of the fact that no matter what I did I couldn’t keep up, I just kept sliding further and further behind in everything. Further out of sync. The truth was my clock was winding down, and anemia was the culprit. It was hard for me, and for those close to me, to see because the changes were so gradual. Tick… tock… tick…. tock…. Who forgot to wind the clock? Maybe a little over a year ago now I started having vicious menstrual periods, with extremely heavy bleeding and horrible cramping. The first time it happened I thought to myself, well that was odd. The next few times it happened I chalked it up to “being in my forties now” (and yes, I have been far too quick to attribute everything to hitting my forties!) . Despite my husband nagging at me to go to the doctor’s, I let this go on for longer than I should have, writing it off as the horrible new normal. When I finally did bring myself in to see our family doctor, testing revealed uterine fibroids and serious anemia. It was an immense relief to find out that this “used up, tired out, my brain has left on a permanent vacation” feeling wasn’t normal, wasn’t just part of motherhood, or part of growing older. You know, you don’t die from fibroids. They are totally non-lethal. Painful, annoying, misery making, but non-lethal. However the fibroids were responsible for making me bleed more, and that bleeding was responsible for the anemia, and anemia, and the complications arising from anemia, can be life threatening. What life with severe anemia feels like. While I was waiting for test results, waiting to see specialists, things kept getting worse. Walking the kids to the bus stop each morning felt like running a marathon. Just sitting and typing would use up all of my energy. Just sitting and having a conversation was too exhausting. I had dizzy spells. I felt like there wasn’t enough oxygen in the room, like I wasn’t getting any air. My heart would race or skip a beat. I had chest pains ( I went to ER one day thinking I was having a heart attack only to be told it was a normal side effect for anemia.). My hands were so cold they hurt. I needed naps. I could only stay up for a few hours before basically passing out, whether I chose to or not. 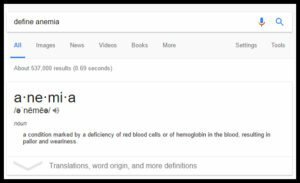 Prior to being diagnosed, I had a vague idea of what anemia was. After reading up on it I learned that it’s really all about oxygen. When you’re anemic your red blood cell count is low, and it’s the red blood cells job to deliver oxygen throughout your body. That fogginess in the brain? It’s because the brain isn’t getting enough oxygen. That feeling like there isn’t enough air in the room? It’s because the body is trying to say it wants oxygen. Those pains in the chest? It’s because your heart is working overtime, trying to deliver oxygen throughout the body. Have you ever pulled an all nighter? Do you remember what it feels like? In 2014 and 2015 I stayed up for over 24 hours straight to help raise money for the Children’s Miracle Network during our Extra Life gaming marathon. I remember how in those last few hours everything starts to blur. It’s hard to think straight. Playing even a simple board game is hard. Learning the rules to a new game seems ridiculously impossible. It feels a bit like being drunk. You forget things. You slur your words. You wonder if you just might pass out. Well, having severe anemia feels like waking up each morning to find that you are already in hour twenty of the twenty-four hour marathon. I mean I thought I knew what tired was. Just a little over a year ago I was diagnosed with sleep apnea. I remember going to the doctor and telling her how utterly tired out I was, how I could fall asleep anywhere, anytime, at a moment’s notice. And that tiredness, that lethargy, it was nothing compared to what I was experiencing now. Too tired to focus. Too tired to think. This was a new level of exhaustion. I mean I’ve lived through two newborn babes. I remember going for weeks at a time with barely any sleep because my twelve month old wasn’t sleeping, and so neither was I. I remember being so damn tired that I thought I was going to break, and that had nothing, absolutely nothing, on the level of exhaustion I was at now. It was like I kept finding new rock bottom, cellar, basement levels of exhaustion. 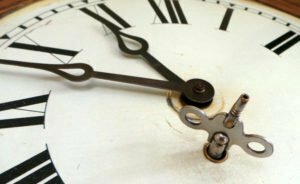 Every time I thought it was as bad as it could be, the pendulum would swing and tick, tock, tick, tock, I would continue to inch gradually down deeper and deeper into a land where I was too damn tired to move. My house fell into disarray. My blogging was non-existent. I felt like I wasn’t really living. I was just getting through each day. I wish I had gone to the doctor’s sooner. Started on the iron pills sooner. Spoken to the blood specialist sooner. Found out about the fibroids sooner. Right now I am taking these pills that are supposed to shrink my fibroids. They also have the happy side effect of stopping me from menstruating. I am taking iron pills, with a big glass of OJ, each day. I’m eating a high fibre, high iron diet. And I’m being carefully monitored by a bevvy of specialists. I am feeling better. But it is slow, gradual. Tick… tock… tick… winding back up the clock. Better and better, by tiny increments, each day. The doctors have told me it will take several months for my blood iron levels to get back up to where they should be, and another six months after that to build back up my iron stores. In the meantime, I am taking it easy. Trying to give myself grace. Well, as much as I can while still being a mom and running a household. When I forget and try to push myself my body gives me a loud warning yell, reminding me that I’m not quite out of the pit yet. It took months for my clock to slowly wind down, and it’s going to take months for it to get properly wound back up again. What about you folks? Have you ever shrugged off exhaustion as a normal part of life? Have any of you ever had anemia? or some other ailment that crept into your life so gradually that it was difficult to notice? Oh dear me, not good news at all but at least you now know it’s not due to being in your 40s and though it’s a slow job it is treatable. Keep your head up and don’t try to do too much, rest as much as possible. I’ve been writing a LOT off to being over 45 lately… my sister sent me an article which convinced her that we were both just in Peri-menopause and it fits but I know I should get to the Dr to discover really what is going on – but where do I find the time OR a Dr. In NS we are scandalously short of Dr’s… again another excuse. I think some times of what stewardesses say – for Mom’s to put on their air masks first NOT the children’s then yours – so that someone will be aware to help the children put their masks on and after that. It makes sense but it’s hard to put in front of your heart. I need to be there for my children but if I don’t take care of me, how can I be there for the children? I finally started to put out a search for a Dr the other day – guess it’s time to stop neglecting me so I can be there for them in the future I guess. Here’s hoping your iron stores fill fast and you begin to feel like you used to! I too am a heavy bleeder but it’s believed to be due to my Hashimotos Hypothyroid condition. So my chronic low ferritin anemia has been treated for years with tablets, shots and even hospital IV’s. My whole adult life has been ‘tired’! This was a total eye-opener. My mom was anemic when I was a kid and I never thought she was tired. Little did I know she likely suffered as you are right now. I send you hugs. PLEASE let me know if I can help in any way. Glad you are starting to feel better and I can see how well you are understanding your health condition and yourself now…and that’s a very good thing. A year from now you will probably be feeling like a whole new woman. Here’s to a much better 2017 for you! I had pneumonia and didn’t know it. We only found it b/c I thought the boys coughs sounded bad. I was exhausted but I had 3 boys under 3. I barely slept at night. I couldn’t get up the stairs without taking a break, but I figured with no sleep, and a cold that was it. I was trying to tell the doc about the boys, and he was like ok we will worry about them in a minute, and I would say I am not here for me. I am here for them. He says good thing. They sound fine. You are making me nervous. So he found out I had pneumonia and I went home and slept 😛 I made hubby handle everything. I now had a reason to rest. You do too. REST when you can. I have pernicious anemia which means I need a b12 injection every 3 weeks or so. I wasn’t diagnosed until in my 40s; but I felt like crap! Hope you continue to feel better, I’ve missed you and your blog! I suffered from anemia as a result of heavy periods (3 weeks of bleeding, 1 week of no bleeding); I was later diagnosed with a genetic blood disorder that prevented clotting. It was the most miserable 5 years of my life… I hope you feel better! It took me almost two years to get back to 100%. wow , that’s scary , sorry you are going threw this , must be hell in plain words !